In my book and previous posts, I build a broad case for the importance of big data and AI in next-generation mobility, and provide several examples of data that is being collected, or can be collected, in a variety of transportation and logistics situations. Next-generation mobility is about autonomous vehicles, electrified vehicles, and on-demand shared mobility and the use cases they enable. It is also about how to best utilize available transportation and logistic resources, in conjunction with various types of autonomous vehicles, to address some of our biggest challenges. These include pollution and climate change, urbanization and congestion, aging population, traffic fatalities, and injuries, as well as maintaining economic prosperity by operating highly optimized supply chains that span the globe. As I continue to analyze the value chains that emerge in next-generation mobility, it is important to look closely at the functions big data and AI enable in the major use cases for such vehicles, and the monetization that can result through these functions beyond a vehicle’s autonomous movement. 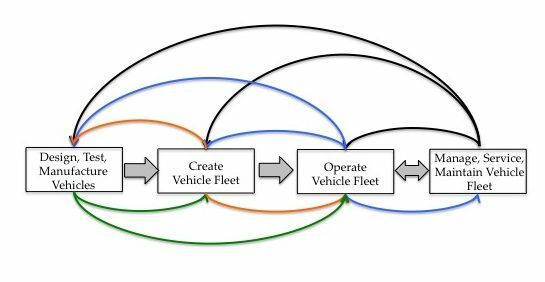 While most news is about consumer transportation in personal autonomous vehicles, as we continue to experiment with and dream about applications for autonomous vehicles (electrified or equipped with internal combustion engines), we envision six basic use cases of increasing complexity. The sequence in which these use cases will be deployed and their success will depend on our ability to create the right technologies, devise the right business models, and institute the appropriate regulations. With particular regards to technology, one of the biggest obstacles for the broad utilization of autonomous vehicles concerns their ability to deal with dynamic environments that change unpredictably. For example, while driving down a San Francisco street an autonomous vehicle may need to deal with pedestrians jaywalking (and in the process distinguish whether the jaywalker is a lone adult, a handicapped individual, an adult accompanying a child, etc. ), bicycle messengers cutting through traffic lanes, a bus that suddenly has to move outside its prescribed traffic lane in order to get around an illegally parked delivery truck, and other such situations. While our autonomous vehicle technology is getting better at dealing with such unpredictable changes to a traffic environment, there is still a lot of development and testing work that needs to be done. Cars used for ride-hailing. I have already discussed in other publications the advantages that autonomous vehicles will provide to companies offering urban and medium-haul (up to 150 miles) ride-hailing services. They include the ability to reduce operating costs, achieve higher profit margins, and tocontrol the overall user experience. While trials of growing scope will continue, the broad use of autonomous vehicles for such applications is several years away and will depend on achieving the right technology reliability, identifying the right business model, instituting the appropriate regulations, addressing potential liability issues and achieving consumer comfort with the service. ACE Platform. Automakers and fleet operators seek to develop a reliable, and highly configurable stack that enables Level 4 and Level 5 autonomous mobility under any condition and with the highest safety. Such ACE Platforms will result in businesses that have better margins than any other vehicle component. This is why there are so many companies from incumbent automakers to Tier 1 suppliers and startups working on the development of such platforms. As we are already seeing with Tesla, an extensible ACE Platform offers monetization opportunities through subscriptions to receive OTA updates, and the acquisition of new features from the automaker, the ACE Platform provider, the fleet operator or a network of partners through transaction-based, advertising-based, or loyalty program-based business models. Fleet operators or drivers (in case of vehicles with L4 driving automation) can initiate subscriptions and/or one-off transactions. Fleet management platform. By tracking the right data through this platform it is possible to drive the maximum utilization of each vehicle per location (which will undoubtedly be different in New York than in San Francisco, or in Singapore), while controlling the fleet operator’s costs, and improving vehicle economics, fleet management and maintenance economics, lower the fleet insurance economics, and increase the vehicle’s utilization and the corresponding fleet’s performance thus improving the overall economics of the fleet operators.